October in Mumbai is often much hotter than the April – June heat. With no hope of the cooling monsoon around the corner, we simply have to grin and bear it until the we ease into ‘winter’… aka 29’c! And let’s face it – sweaty weather is not exactly optimal whisky tasting conditions. However, undeterred, this Whisky Lady found ways to soldier through! Hellyers Road 12 year 46.2% – Not for the novice but absolutely worth exploring! In July 2015, our whisky tasting group was invited by International Beverage Holdings to join a ‘Master Class’ with master distiller Stuart Harvey for a mini tour of their Inver House Scottish whiskies – Balblair, Old Puteney and Speyburn. We began our whisky sampling with a Balblair – a Highland distillery in Edderton, Ross-shire, Scotland which was founded in 1790 and boasts having one of the oldest archives in distilling – with a ledger entry from 1800. One of the hallmark approaches with Balblair is to focus ONLY on vintages rather than producing consistency to a particular flavour profile for say a 10 year, 15 year, 18 year, etc. Stuart shared that 1989 “was an amazing vintage!” where the 1st note was unmistakably banana yet was very delicate. Even with this vintage, now into their 2nd bottling, he noted there is some variation. Which is half the fun of taking a vintage approach – where the distiller manager John MacDonald can wait until he believes it is ready for bottling – and then have additional releases as and when desired with variation entirely acceptable. Lucky us – we had an opportunity to sample the 1st release of the Balblair 2003! Stuart shared they typically use 2nd fill bourbon barrels from Buffalo Trace. He noted this Balblair 2003 was filled at 67% and matured at an even temperature between 12 – 14’c for 12 years. While whisky typically looses about 2% to the angels each year, this is offset by absorbing moisture from the atmosphere so was still 61% when it was ready to dilute and bottle 12 years later. For many of us, the Balblair 03 was the whisky of the evening – we enjoyed its nuanced Highland balance of fragrances, fruit and creamy spice. The American oak, ex-bourbon barrels used in maturation impart toffee, butterscotch and vanilla notes. 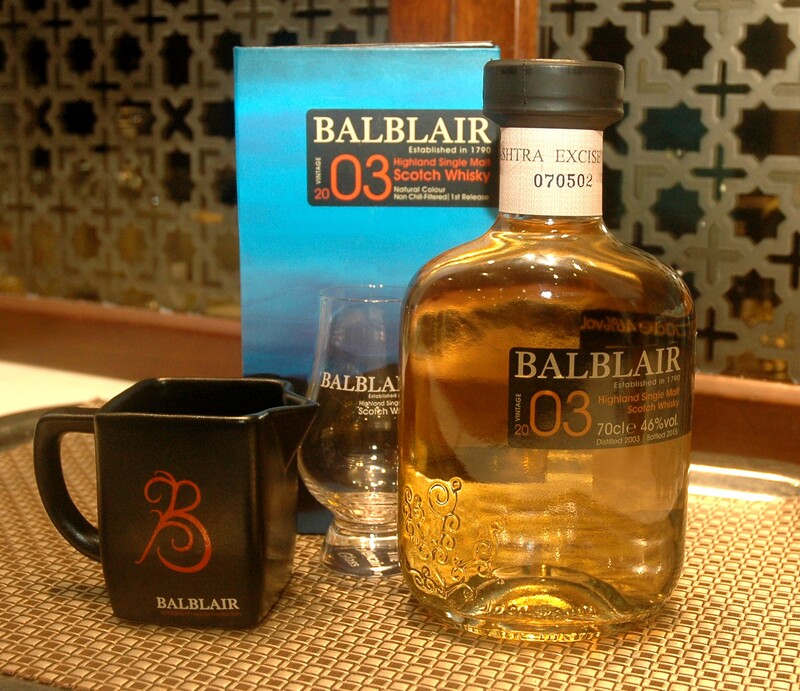 Appearance – Balblair 2003 is golden amber in appearance. Nose – On the nose there are the signature Balblair aromas: floral and fragrant punctuated with citrus fruits, apricots and honey. Palate – On the palate it is full bodied, with notes of oranges, lemon, honey and spice. Finish – The long lasting finish is sweet yet spicy; a superbly well-balanced dram. Confession time… I revisited the Balblair 03 in September with the delightful Karen Walker, Marketing Director of Scottish Brands for International Beverage, and our newly formed Mumbai Whisky Ladies group. The notes from that evening are most amusing and deserve a separate post! While our original tasting group has perfected the art of hosting whisky tasting sessions, my new group of fabulous women are mostly new to hosting structured tasting sessions. So with our whisky ladies in mind, I put together a ‘how to’ for hosting with flair and panache! Capacity – Start with how many people can comfortable sit around a circle to discuss, debate, swish, swill, swallow and kibbitz together… if you have too many split around the room, that’s more of a party than tasting. Yet too few and you miss out on the fun of different impressions and reactions. Diversity – The best whisky tasting group has a range of palates and perspectives. How boring would it be to all pontificate in unison? Scents – If you have novice whisky samplers coming, it is advisable to let them know any strong perfumes are a ‘no no’ as it interferes with the whisky aromas. Ditto for you as a host – including those gorgeous flowers or spicy cooking smells. 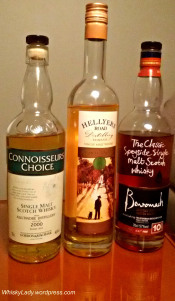 Contributions – Decide how the whiskies will be selected and in which order. Personally, I prefer no more than 3 samples per evening. I also prefer to have a theme behind the sampling journey. 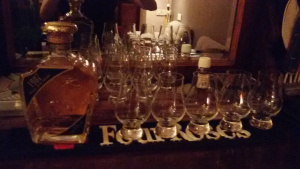 Glasses – I have a distinct preference for either Glencairn or tulip glasses. We’ve tried other options and they just don’t work as well. If possible, it is ideal to have one glass per whisky per person. If not, then just rinse between whiskies. Presentation – Do you wish to taste blind, then reveal the whisky? Display each whisky openly, sharing stories as you sample? Either works! Palate cleansers – During the tasting, should only have cucumber or bread sticks / crackers with minimal salt and no other flavours to influence. Best are simple oat cakes, but not everyone goes to the effort of making or finds them easy to acquire. 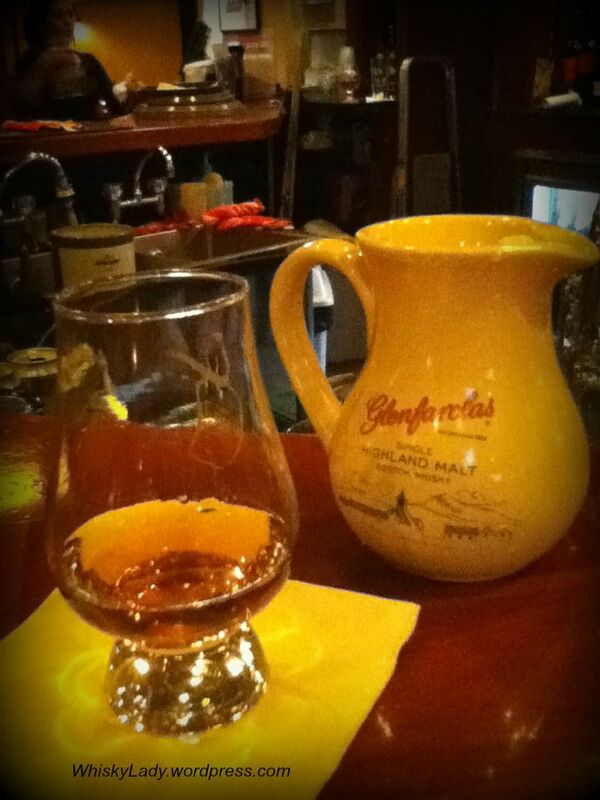 Water – Everyone should have their own water glass to liberally consume – particularly between whiskies. There should also be water jars to refill, rinse glasses, etc. Plus it is ideal to have a couple pipettes or droppers to control adding just 2-3 drops of water to a whisky. Spittoon – Whether you follow the ‘spit the 1st sip‘ adage or not, it is still good to have a bowl to dump excess whisky and water from rinsing glasses, etc. Food – The best approach is guests come after having already lined their tummy before tasting – a soup with bread is a great base. However if that isn’t possible, it is good to greet with something light, no strong flavours, just to coat the belly and get the taste buds revved up for the whisky goodies to come! Post tasting, if not dispersing immediately, feel free to get creative, playing around with foods you think will pair well with whiskies! Just refer back to #3 on scents – ideal is to time your food order to arrive when you expect to finish tasting. Anyone else have simple tips for organising a whisky tasting evening? In our October tasting session, nestled between the light Aultmore 2000 (Gordon & MacPhail) and the rich, complex and delightfully mature seeming Benromach 100′ Proof 10 year, was an unusual whisky from Tasmania. Now, I must admit, I’ve only tried one whisky from Australia so far… the much coveted Sullivans Cove that catapulted Tasmanian whiskies to the top of the world (in Jim Murray’s ever not so humble opinion!). However thanks to the lads over at Whisky Waffle, I’ve read with great jealousy their reviews on various Tasmanian whiskies. Hence distilleries like Lark, Nant, Overeem and – yes – Hellyers Road are distressingly familiar names yet completely out of reach… until our host managed to acquire the Hellyers Road 12 year. Nose – Instant overripe banana and jackfruit, a little cod liver oil, bursting with character not at all subtle. Gives you a flash. Yet interesting. Unique. Good then not so good with that undertone of overripe on the edge of rot. Quite vegetal. Needed to wait a bit. Soaked rice like sake. Sweet raisins. Just kept evolving. After sampling, had that red pill coating that pretends to be sweet but is actually medicine. A little wood furniture smell after adding water. Palate – Boom! In your face coffee, the dry bitterness of tea, chocolate, not sweet, a little overpowering, a flash that is very bitter, mocha without sugar, then a little grape peel. Such a contrast between the nose and palate. Finish – Think green tea. Water – The coffee explodes because of the spice. Then once it settles… we could hear remarks like “I’m absolutely loving it!” “Me too!” Clearly this is way to have this whisky – just a few drops of water. And the finish? It becomes fruity rather than bitter tea alone… After some time, that little bit of pani adds magic – transforming it from being a bit of a difficult character to becoming completely enjoyable. Impressions – This is a very challenging whisky. Not one for novices. If you have an evening with a true whisky explorer – this is without a doubt one you would like to pull out and enjoy together. Speculation – Who cares about age! Not Scottish. Not Indian though has a certain boldness of character. Stands out as unique. Guessed the strength to be mid-40s. The reveal… Yeah! Another whisky from Tasmania!! As our conversation continued, we kept discovering something new, another element… from not quite being sure whether we liked it to clear converts. This is definitely not a whisky for the faint hearted. It demands attention, time and an opportunity to grow on you. Once you get past its highly unusual contrasting qualities, it reveals remarkable depth and character. There is simply something ‘more‘ going on here. For those not familiar with Hellyers Road, it is the largest single malt whisky distillery in Australia. Once upon a time (that’s 1825), a gent named Henry Hellyer came to the interiors of north west Tasmania as chief surveyor of the Van Dieman’s Land Company. The 12 Year carries all the attributes of its highly-acclaimed predecessors, aged in American Oak, non-chill filtered and bottled at 46.2% alc/vol. Our distilling process ensures an enhanced single malt flavour delivering a well-balanced and very smooth spirit. Released in 2014, this superb whisky imbues a calming softness, reflective of its age. An elegant, gentle spirit that extols an oily sweetness over tones of vanilla and citrus. The mellow aftertaste provides reward for effort and a subtle reminder of the pleasures this hallmark spirit embodies. Whisky Waffle – and explore more of their posts on Hellyers Road! Our October 2015 whisky tastings reminded us to go slow, meander through the offerings to let each slowly unfold… we began with the light Aultmore 2000 (bottled by Gordon & MacPhail) and closed our evening with a special 10 year from Gordon & MacPhail’s distillery Benromach. Palate – Kashmiri spicy but smooth, not oily, truly amazing with lots of character, a low viscosity, chewy dates, ripe berries, a sense of richness or ‘fullness’, creamy, warms into smoky raisins yum! Water – Yes please! A few drops opens it up. Comments like “Fabulous!” “Absolutely fantastic with water!” It became even more rounded and did not lose its character at all. Just a couple drops prompted even more bacon to emerge. Impressions – Clearly mature and complex! A whisky you want to pour and have a long affair with…. This is to end your day. What is most remarkable is how it just kept evolving… Easily a whisky that you could stretch over a long leisurely conversation with a fellow whisky appreciator, interspersing new observations about the whisky with other engaging topics. Speculation – One member’s immediate reaction was “Islay!” with its peated robust character. Bantered around the possibility of it being 16 years? Reminiscent of a Glendronach 21 Parliament… Thought the alcohol content likely higher than the previous two (Aultmore 46% & Hellyers 46.2%). 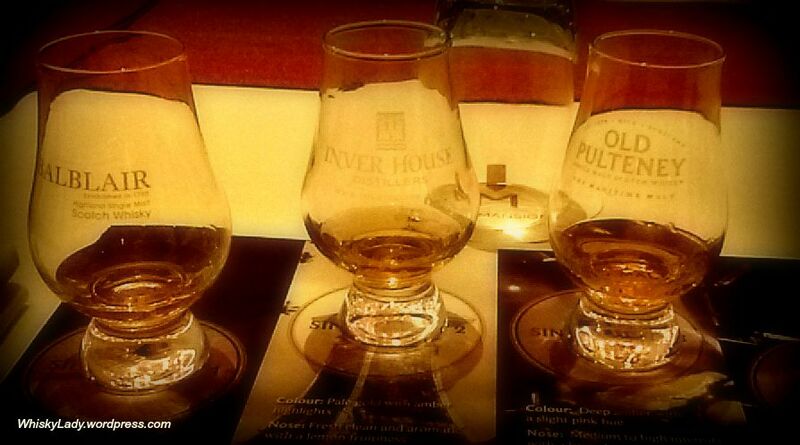 Unlike most of our sessions, we held back the whisky reveals until after we tasted all three whiskies…. The reveal – Only a 10 year from a distillery that once upon a time had somewhat indifferent offerings. Since the Gordon & MacPhail took over, with renewed attention and care, they are now releasing some remarkably good whiskies. 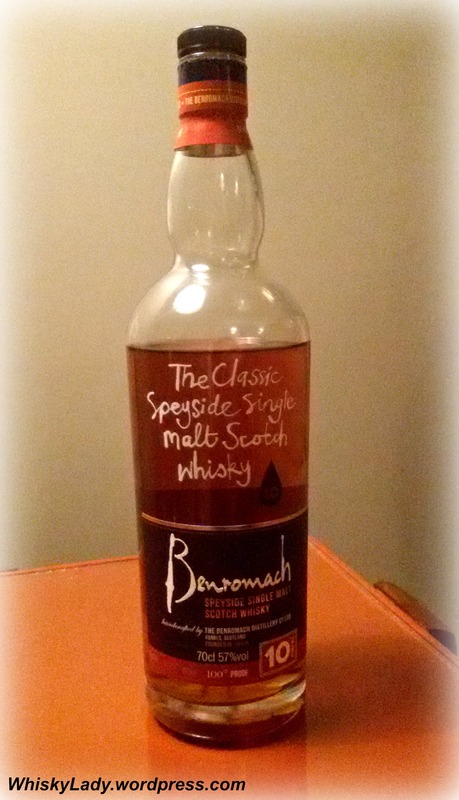 If you read the Benromach story… you come to understand that their interpretation of a classic Speyside is the 1960s version when light peat was part of a Speyside’s character. Nose – It has an intense Sherry nose with heaps of stewed apple, pear and delightful vanilla pod aromas… delicious toasted malt aromas develop and complement an underlying menthol edge. Taste – There’s cracked black pepper with juicy fresh strawberry and raspberry… hints of orange peel and milk chocolate combine with a delicate smoky edge. Nose – It’s fabulous, with initial hints of beeswax polish and peat smoke… followed by sweeter aromas developing with ripe banana and kiwi bound together by honey. Taste – Roll it around your palate and enjoy the sweet and salty effect with ripe banana and blackcurrant flavours. Notice the emerging creamy milk chocolate edge with a long rich finish of lingering subtle smokiness and bonfire embers. Our October tasting session had a theme of ‘go slow’… let the whisky evolve… Each had its unique character and each needed proper time and focused attention to unravel its mysteries. We also went back to our original ’spit the 1st sip’ approach – helping us better calibrate our palate to appreciate the three distinctly different whiskies. Our first whisky of the evening was yet another treat from independent bottler Gordon & MacPhail – this time a delicate Speyside from Aultmore. Finish – Some debate as the initial impression was the finish was quite limited… yet still felt satisfying. As we ‘tuned’ ourselves to the nuanced character, began to appreciate that in fact it has a long subtle finish, really quite delicious! Speculation… As we sample blind, we began to assess our thoughts about the whisky. It vaguely reminds of Glenmorangie in its light fruity floral sweet character yet different. Age was a bit difficult to gage – not very young but also not too old. Certainly not more than 16 years… Sense that the alcohol hovered around 43% given its light approachability. The reveal… Our first as a tasting group from this distillery and yet another ‘hit’ from independent bottlers Gordon & MacPhail. It is getting to the stage where we can blindly grab anything from their Connoisseurs Choice line! Our host shared that he briefly sampled it at a whisky event in Europe. While normally such light whiskies are not his personal preference – this one stood out as something compelling enough to explore further. We agreed! Knowing it is a light whisky and would be the first of the evening, he chilled the whisky for 45 mins in the fridge before serving to help ensure the viscosity for our tasting. Our conclusion was that this was the kind of whisky you would just sip on your own while reading a good book, curled up with a cosy blanket on a cool evening. Something to slowly enjoy its subtle range of aromas and taste. It doesn’t need conversation. It doesn’t need company. It is for those times you simply want to relax in quiet comfort. Matured in a refill American hogshead and refill sherry hogshead. Natural colour. Non chill filtered. Previously Aultmore was rarely available as a single malt beyond independent bottlers, instead found as part of popular blends like Dewars. Some may recall that I tried a couple Aultmores on my July London trip – both the 12 and 21 year – part of Bacardi’s “Last Great Malts of Scotland” range. I was surprised to find them so appealing – and recall being impressed that the promise of the nose followed through on the palate. I, for one, look forward to both exploring more Aultmore and more from Gordon & MacPhail! One highlight from our July London trip was an afternoon spent at BAFTA – the British Academy of Film and Television. While our host happily sipped a whisky, my body clock was still on Toronto time and it just was not saying whisky. Seriously. There are times I’m not actually in the mood for a whisky. I know you don’t believe me, but it is true! So our host suggested a light Pimm’s cocktail. How quintessentially British. It was completely refreshing and utterly perfect for the mood and moment. Now… if only I could get Pimm’s in Mumbai!! 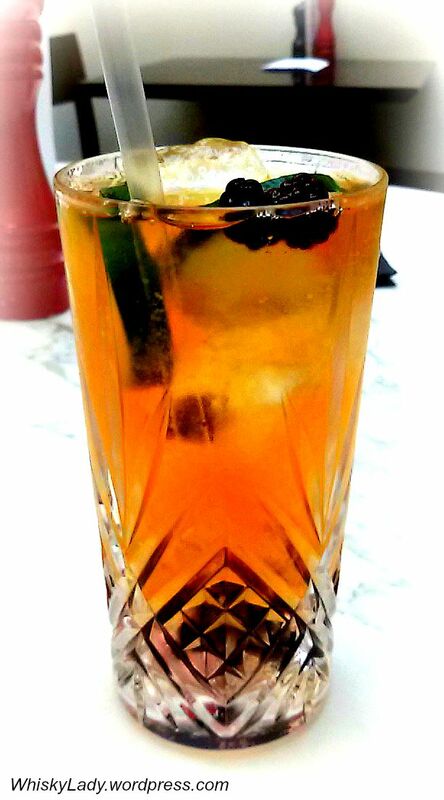 You can find more cocktails here: Pimm’s based cocktails. For those new to Whisky Lady in India, many of the notes come from tasting sessions of a small private whisky group based in Mumbai. Which means only one person (i.e. the whisky contributor/host) knows what is being served. That puts him / her firmly in the ‘driver’s seat’ as far as whisky selection and tasting order. Over the years, we’ve tended to apply three simple guidelines. They may seem obvious but can also produce surprises too. 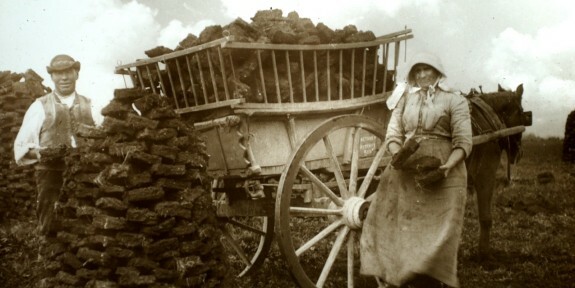 Naturally we pay attention to peat levels – it is hard to appreciate an exquisite delicate grain whisky after a peat monster! However usually, the host also has not tried the whisky before our session so relies on the distiller or bottler tasting notes or others reviews – sometimes the descriptions are a bit misleading. We may pay attention to alcohol strength – you don’t want to whallop your guests with a bold cask strength whisky at 60+% then follow with a wimpy 40% strength. However when all the whiskies are in the 45 – 55 % range, this is less of a factor. We’ve also been surprised by some incredibly smooth cask strength whiskies that are highly deceptive in their alcohol level – one time we guessed at most 48% and it turned to be 63.1%! 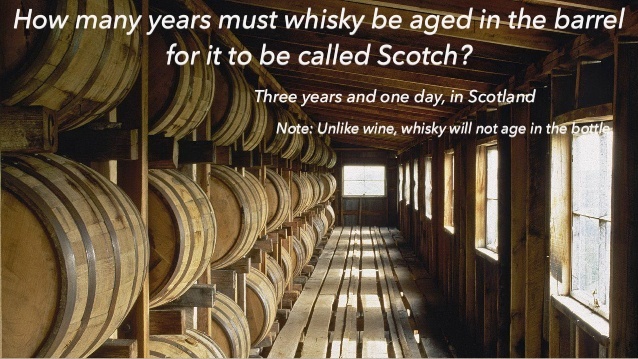 Another way to order whiskies for tasting is by age. Generally, young whiskies with an interesting new make spirit have some character but are still developing whereas there are certain levels of nuance and complexity that really only comes with maturity. If the young upstart comes after a grand old dame, you may miss appreciating some of what the youngster has to offer. However equally, we’ve had a 25 year old be completely outclassed by a young No Age Statement (NAS) whisky. So… while these are tips that generally work, half the fun is discovering how in the world of whisky, there are exceptions to every rule! Additionally, it isn’t one factor alone but a combination that helps make the tasting order decision. Most important is simply to go on a journey of discovery and explore what works for you! As usual, our merry malt sippers tasted ‘blind’ three different whiskies, revealing the sample after snipping, swishing, swallowing and hopefully savouring! 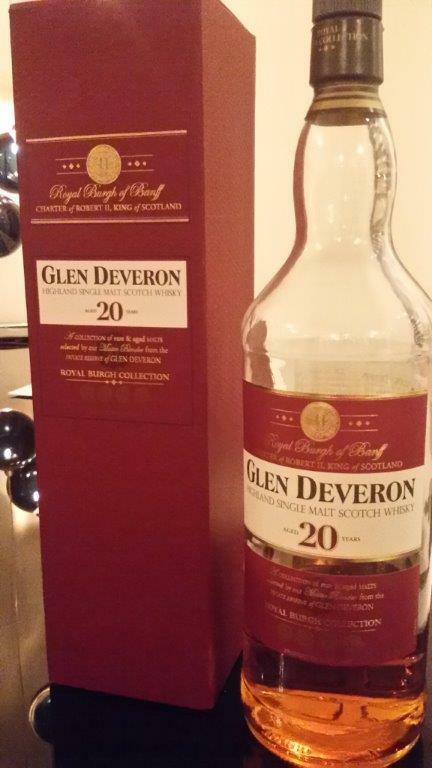 On this evening, our whiskies were carefully ordered by age – 3 year, 16 year and closed with this 20 year. Colour – Dark amber…. So dark couldn’t help speculate perhaps some of the colour was ahem… enhanced? Nose – Sweet all spice, some jackfruit, banana pie, perhaps a hint of caramel too? 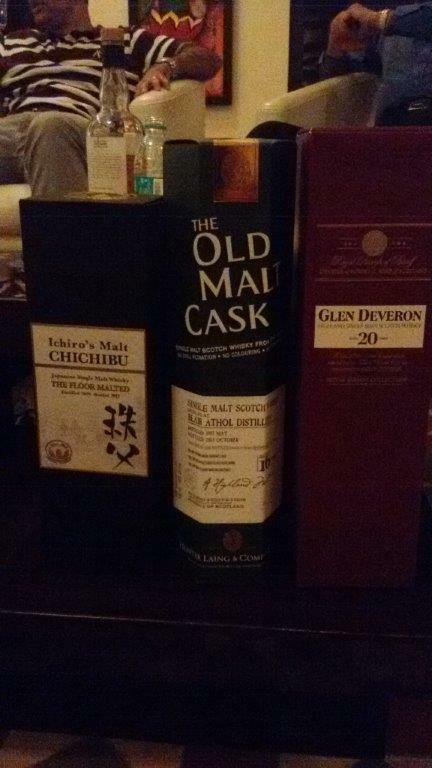 Reactions – Oddly disappointing… perhaps as the Blair Athol 16 year had such an unmistakable character or the Chichibu ‘The Floor Malted’ 3 year was such an interesting start, the Glen Deveron didn’t stand out. The nose was promising, taste was somewhat familiar and the finish had more of that toothpaste mint than a fresh sprig. The reveal – None had thought it was 20 year… with such an age, it is entirely possible the colour is natural. However goes to show our minds came to different conclusions based on our experience with the whisky which simply did not have the complexity and depth we seek in more mature whiskies. While I initially blithely listed this as “Glen Deveron” distillery, turns out it is actually part of Macduff distillery, which was acquired by William Lawson Distillers, which became part of the Martini & Rossi corporation in 1980, acquired by Bacardi in 1992, who put their subsidiary John Dewar & Sons in charge of the Macduff distillery. So… think I’ll stick with calling it Macduff?! So… this release from Macduff distillery is part of their Royal Burgh of Banff Collection with 16, 20 and 30 year releases for the duty-free market. So does age really matter? At the hands of a master, apparently a mere 3-year-old ‘toddler’ can out-class a 20-year-old ‘adult’! Blair Athol distillery is part of Dieageo, however it isn’t one of their single malts that is so well known in these parts. 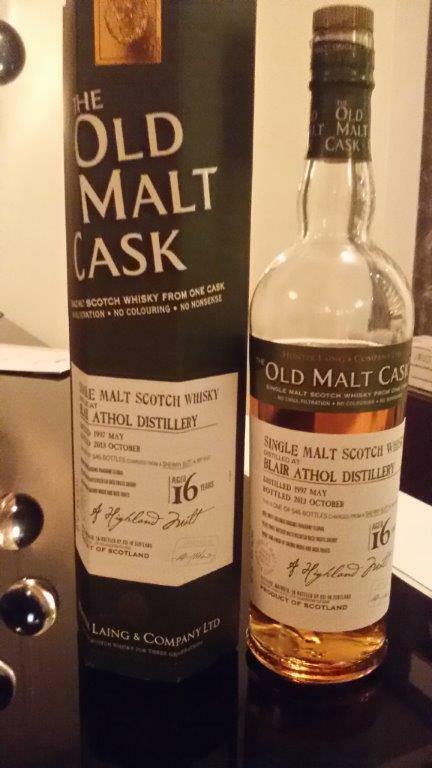 That said, if you’ve ever had Bell‘s, you’ve had Blair Athol whisky. Quote of the eve – As though an elegant lady sauntered in the room, then turned out to be completely wild in bed! The reveal – Part of Hunter Laing & Co’s Old Malt Cask series. 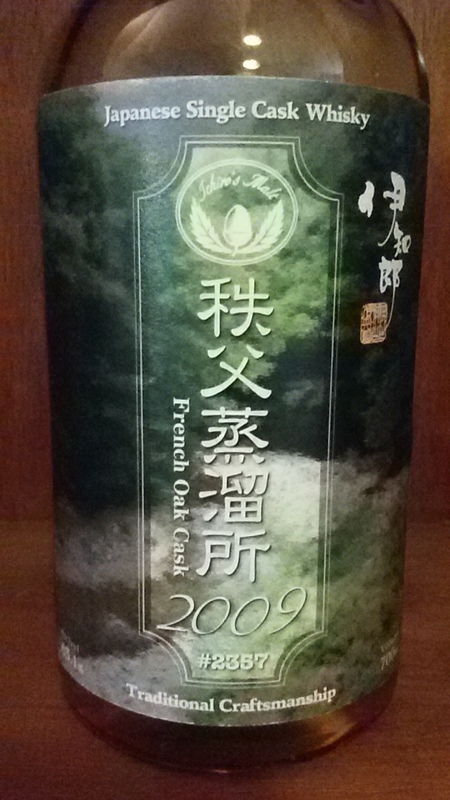 From May 1997, bottled in Oct 2013, 1 of 545 bottles. We first sampled this in Oct 2014 together with Ichiro’s Malt Chichibu ‘The Floor Malted’ 3 year and Glen Deveron 20 year.